July 28: J. Cole, Lana Del Rey, G-Eazy, the 1975, Flosstradamus, Bastille, the Last Shadow Puppets, Excision, the Arcs, City and Colour, Kurt Vile and the Violators, Daughter, Danny Brown, Tchami, Cashmere Cat, Yeasayer, Kehlani, Melanie Martinez, Alunageorge, Towkio, Wavves, Haitua Kaiyote, Bob Moses, Don Diablo, Grandtheft, Mr. Carmack, Bas Cozz Omen, Somo, Bad Royale, Cloves, Frances, Wild Child, Autolux, Alle Farben, Jazz Cartier, the Noisy Freaks, Tennyson, Pinegrove, Firekid, Skate Maloley, Lucy Dacus, Arkells, the Greeting Committee. July 29: Radiohead, Future, Major Lazer, M83, Martin Garriz, Miike Snow, Griz, Foals, Ghost, Mac Miller, Cherub, Frightened Rabbit, A$AP Ferg, Duke Demont, Alessia Cara, M0, Lettuce, Frank Turner & the Sleeping Souls, The Struts, Wolf Alice, Saint Motel, Bro Safari, Rufus Du Sol, Audien, Modern Baseball, Skepta, Lewis Del Mar, Boombox Cartel, Kiiara, Hayden James, Day Wave, Party Favor, PVRIS, Haelos, Con Brio, Illenium, Saba, Sunflower Bean, Jahkoy, Race Banyon, Muddy Magnolias, Polly A., Horse Thief. July 30: Red Hot Chili Peppers, Disclosure, Jane’s Addiction, Two Door Cinema Club, Chris Stapleton, Hardwell, Grimes, Leon Bridges, Big Grams (Big Boi + Phantogram), Big Gigantic, Nathaniel Rateliff & the Night Sweats, Vic Mensa, Jauz, Mutemath, St. Lucia, Oliver Heldens, Tory Lanez, Houndmouth, X Ambassadors, The Front Bottoms, The Joy Formidable, Chairlift, Jack Garratt, Marshmello, Alina Baraz, Dua Lipa, Lolawolf, AC Slater, Slumberjack, The Strumbellas, Baio, Nothing But Thieves, Jarryd James, Tor Miller, Generix, Lazyboy Empire, Drowners, Nothing, Secret Weapons, Potty Mouth, Audiodamn!, Honeysuckle. 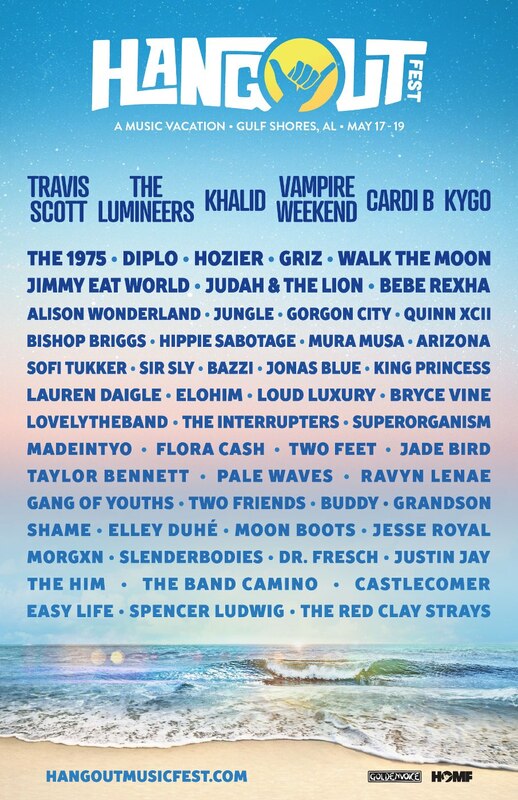 July 31: LCD Soundsystem, Ellie Goulding, Flume, Haim, Halsey, Die Antwoord, Bryson Tiller, Bloc Party, Local Natives, Adventure Club, Zhu, Yellow Claw, Silversun Pickups, Vince Staples, Years & Years, Lindsey Stirling, Third Eye Blind, Seven Lions Snails, Fidlar, Oh Wonder, Snakehips, Marian Hill, Classixx, Aurora, Flatbush Zombies, Muna, Mija, Jackal, Louis the Child, Lapsley, Panama Wedding Banners, Burns, DRAM, VHS Collection, Sir the Baptist, Smino, Unified Highway Mothers, Totem, Dreamers, Lanco.